“The creation of the BSc in Sport Coaching is intended to provide students with an opportunity to combine their practical sport experiences with sport coaching theory to prepare them for successful sport coaching careers,” according to the programme description. “The Open Campus Academy of Sport (OCAS) views the study of sport coaching as facilitating an integrative understanding of sport coaching theory within the dynamic contexts of Caribbean and global sport coaching practices,” the document goes on to say. The introduction of the BSc Sport Kinetics is intended to fill the void created by the lack of sports science programmes in the Caribbean, focusing on exercise and movement science. The programme will introduce coaches, athletes, sports scientists and sports enthusiasts to the science behind movement and high athletic performance. It will provide the foundation for persons wishing to become Biomechanists, Sports Nutritionists, Sports Physiologists and experts in athletic training. It will also expose persons to other emerging fields associated with sport and movement science. The programme is divided into three categories: basic sciences, research and general education. There are two courses that have laboratory components that will require students to attend face-to-face classes. These courses are Sport and Exercise Biomechanics and Applied Biomechanics in Sport and Exercise and will require students to spend one week at laboratories located at the Cave Hill Campus Academy of Sport in Barbados. The BSc in Sport Leadership and Management is intended to provide students with an opportunity to combine their practical sport leadership experiences with sport management theory, and to prepare them for successful careers in a sport organisational environment. Students pursing the degree in Sport Leadership and Management have the option of also pursuing one of two minors, one in Parks and Recreation and the other in Facilities Management. On completion of this degree, students should be able to demonstrate pragmatic knowledge in the areas of general leadership and management, sport leadership and management and parks and recreation management, develop a thorough understanding of the theoretical and work-based knowledge relevant to the application of leadership and management principles to sport organizational environments, and articulate sound policy positions that are in keeping with best practices and cultural sensitivity. The programme will provide a variety of challenging learning experiences for students, enabling them to combine research and theoretical knowledge with professional/practical experience in several related fields. In this regard, some of the subjects comprising the degree include: Introduction to Sport Business Management, Sport Law, Data Analysis in Sport and Exercise Science, Sport Operations and Planning, Sport Policy and Development, Sport Economics and Finance, Fundamentals of Sport Administration, Sport Technology and Design, and Human Resource Management in Sport. To find out more about the new BSc in Sport programmes, please visit http://www.open.uwi.edu/programmes or send e-mail to ocas@open.uwi.edu. 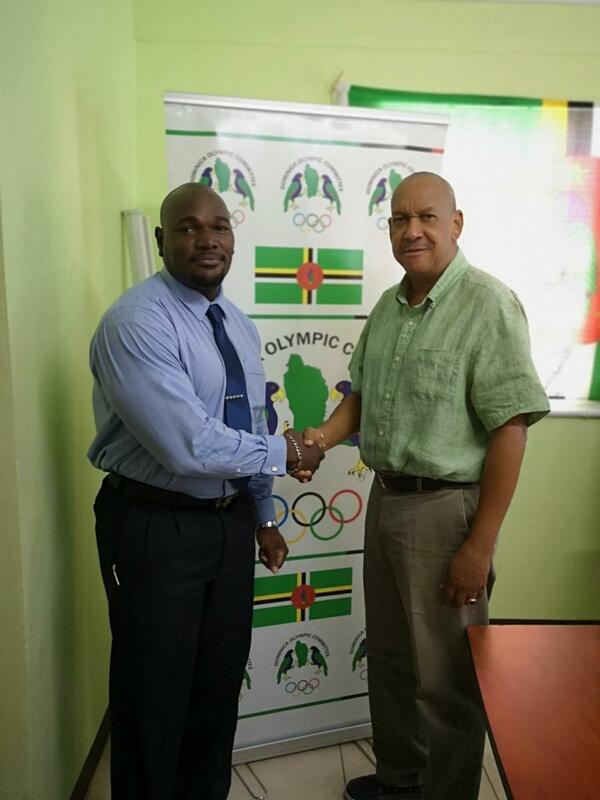 Mr. Billy Doctrove (right) – President, Dominica Olympic Committee greets Mr. Kervin Jean – Head of Open Campus Academy of Sport (OCAS) on a recent visit to Dominica. Honourable Justina Charles, Minister of Youth, Sport and Constituency Empowerment, Dominica. 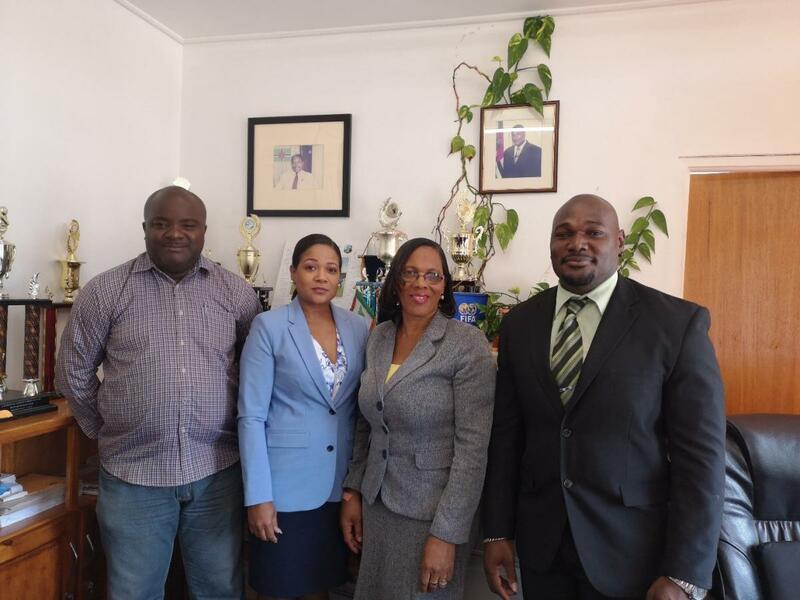 (2nd left) posing with (left to right) Mr. Trevor Shillingford, Sports Coordinator, Sport Division and Ms. Mandra Fagan, Permanent Secretary, Ministry of Youth, Sport and Constituency Empowerment, Dominica. and Mr. Kervin Jean, Head OCAS.